Who doesn’t like going to work looking good and feeling good when looking good! Yes, curves do! I wanted to dress a style that spoke corporate look, but still had fashion tag to it. 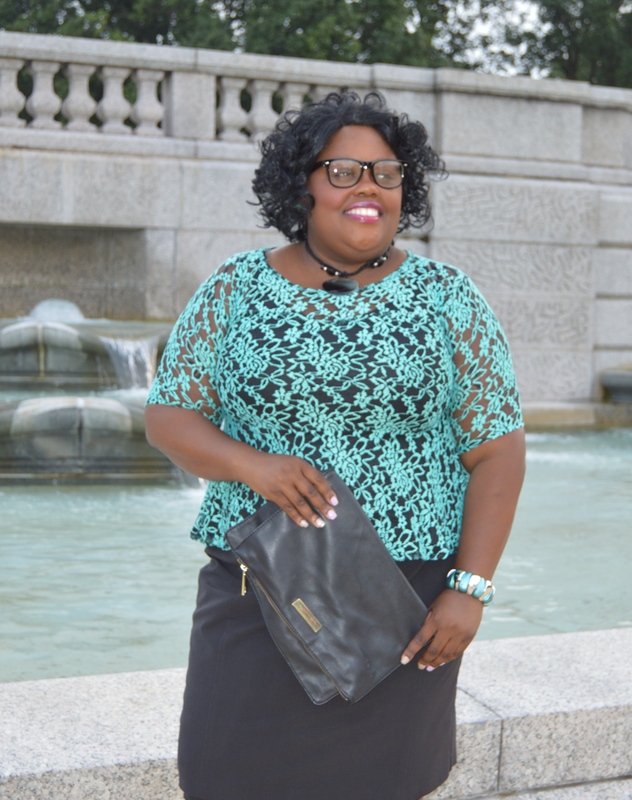 This style is completely from Ashley Stewart. The peplum teal, lace top has intricate details that captives many to look and how it is design to shape to the upper body. It is see thru over the busted area, but with so much detailing of the lace the design shields the skin to fully protruding. The flare of the peplum defines the waistline and makes the bust area look very amusing. This top can be worn with a blazer or suit jacket to satisfy those cool days. I decided to wear a knee-length ebony skirt that compliments the hips and curves. I matched the outfit with an open black, peep-toe heel and added light accessories to highlight the blouse and its beautiful look. This outfit is not only great for work, but can be blending in at happy hour after a great day of at work!